Ever wondered how the modern flashlight works? What happens when you click the switch on, or click it multiple times to change the brightness? I was curious about it as well, so I deconstructed a commercially available flashlight (Astrolux S1) and studied the parts; even reprogrammed it to have different levels of brightness. Here is what I found out. The flashlight has several parts as shown below. Many of the components like the reflector, body, glass, etc are mechanical and are not really interesting for this article. 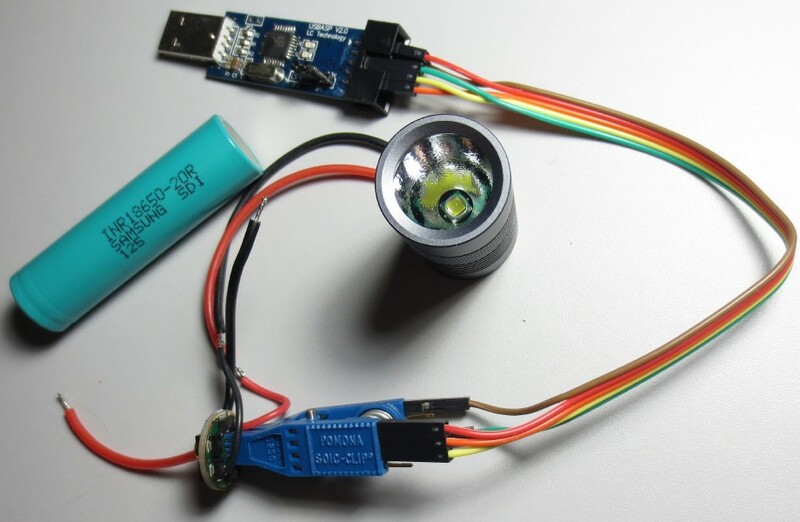 The components that really define the behavior of the flashlight is its switch, battery, driver board & the LED. We’ll look at these in detail. Current from the batteries is controlled by the power switch. When turned to ON, the switch completes a connection between the negative end of the batteries and the body of the flashlight where the electricity travels up to the head of the flashlight causing a difference in potential that is used to power the LED. The difference in potential or voltage drop across an LED is also called its forward voltage (Vf). It tells you how many volts are needed to light it up. For example, a typical Cree XM-L LED has a “forward voltage” (Vf) of about 3.5 V. That is, as long as there is enough current through the LED to turn it on, the voltage across the LED is about 3.5 V. Given this, at any LED drive current, we know the LEDs approximate power consumption. If we drive the XM-L at 2 A, the LED is consuming 2 x 3.5 = 7 W.
The bin of an LED is the manufacturing specifications of the LED. It denotes the range of lumens that the LED is capable of. It is specified as part of the LED model. For e.g., the U2 in CREE XM-L2 U2 denotes the bin of the LED. It does not specify color temperature or actual output, but it does give you an idea of potential lumens. Bins are generally 7% brighter than the previous bin. For instance, a U3 bin will have a 7% potential higher output compared to a U2 bin, assuming the same color temperature. 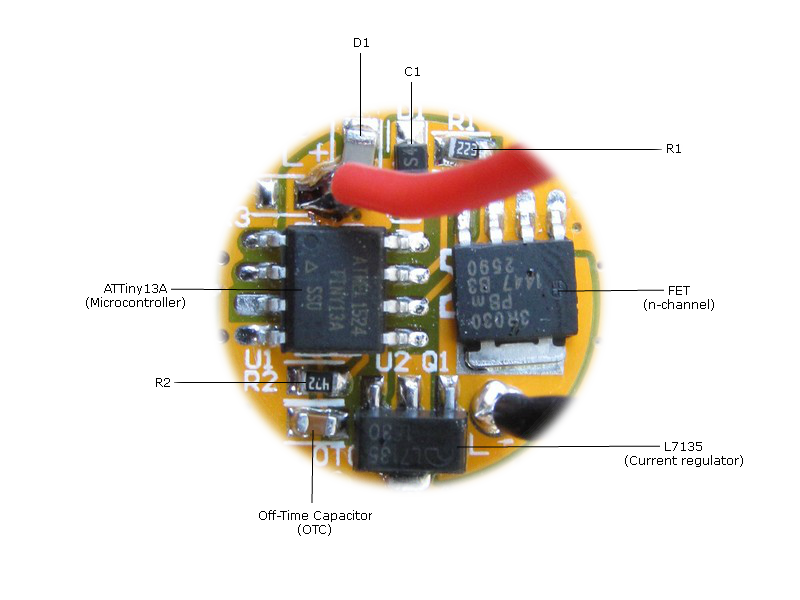 The driver consists of the electronics that take power from the battery and send power to the LED. They amplify or reduce the voltage from the batteries to a correct, constant level for the LED and also control the amount of current that is delivered. The driver also contains the electronics that give the flashlight its user interface, including the number of modes and how those work relative to button presses. The Astrolux S1 flashlight uses an A17DD-L FET+1 driver which was developed by a group of flashlight enthusiasts in an online forum (budget Flashlight Forum, BLF). It is an opensource driver with lots of reference materials and the entire driver code available online. Before looking at the details of A17DD-L FET + 1, lets looks at some types of drivers. If the battery always supplies the correct voltage to an LED, you don’t really need a driver at all. You just need to connect the battery directly to the LED. As its name implies, Direct Driver provides a direct path to the LED, just like old incandescent flashlights. This type of driver is used by people who want to make extremely powerful flashlights. It is also used in cheap flashlights, but they add a resistor that will limit the current to a lower value. This type of driver is quite efficient since all of the power from the battery is delivered to the LED. The disadvantage then is that the current will vary with the battery voltage as it discharges. As voltage decreases the light will dim and draw less current. If a constant brightness is desired, a driver that offers some kind of current regulation is required. This is the equivalent of a direct drive flashlight with a resistor to limit current, but the resistance is constantly adjusted to make a constant current. Most Linear drivers use a 7135 chip as linear regulators. A 7135 will supply a constant 350ma current to a LED. A Linear driver can have a number of AMC7135 current regulating chips installed. Each chip allows 350mA of current through and when wired in parallel, the current adds, so 700mA from 2 chips, 1050mA from 3 chips, and 1400mA from 4 etc. Eight 350mA chips gives 2800mA which is ideal for XM-L2 and XP-L LEDs. Constrained to a particular current, the LED will settle in at its Vf for that current and the rest of the voltage from the battery will be converted to heat by the regulator chips. By connecting different number of 7135s, we can control the current and in turn the brightness of the flashlight. The A17DD-L FET+1 is a hybrid driver. 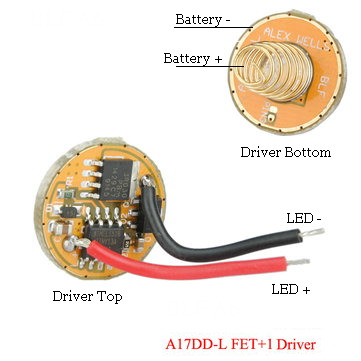 It is a Direct Drive (DD) driver that uses a n-channel Field Effect Transistor (FET) to control current through the LED at higher modes, but it uses a 7135 for lower modes. Both the FET and 7135 is controlled by a microcontroller (ATTiny13A). The FET is basically a switch with very low resistance. It can be rapidly turned on and off by the microprocessor using Pulse Width Modulation (PWM). See The Garage Labs explanation of PWM. Since the FET used is n-channel, it needs to be connected in the return path of the current. i.e., from the LED – to the battery negative. 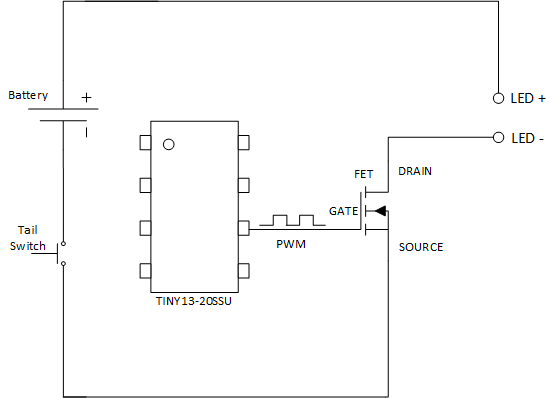 When the current on the gate is large enough, the FET basically shorts the source and drain, connecting the LED- to battery negative. NOTE: The batteries used in AstroLux is capable of delivering very high current (>10A). 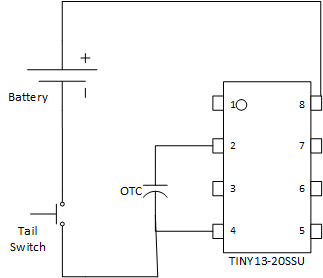 The ATTiny pulls in as many mA as it needs to function, so this high amperage does not destroy the microcontroller, but when the FET source and drain is connected, it can pass all the amps that the LED can accept. So the LED is pretty much glowing the brightest whenever the FET is on. We cannot really controll the current through the LED, so we cannot control its brightness by restricting current. On the other hand, we can controll how long the LED is on by controlling the FET. By turning the LED ON & OFF rapidly, we can simulate different brightness levels. This is done using PWM on the gate. 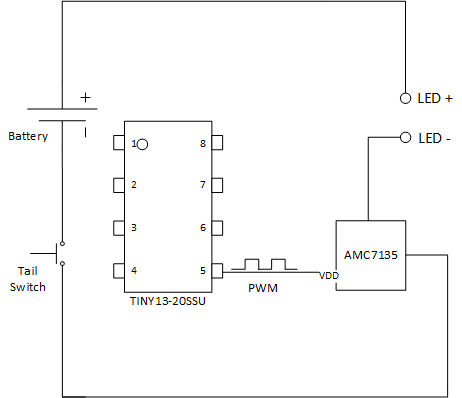 One of the issues with PWM is that it is not very efficient at low modes compared to a linear current regulator. 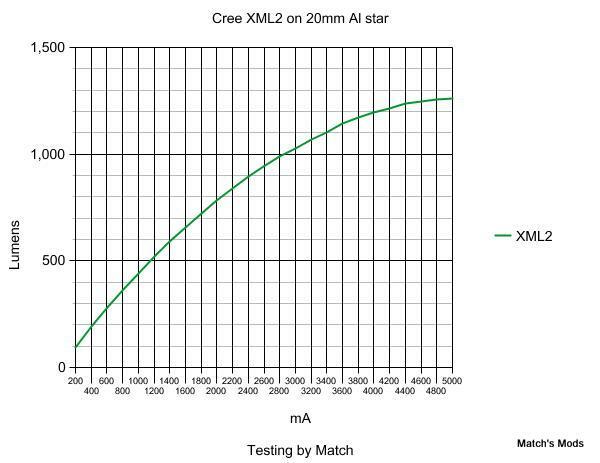 To understand how linear regulation is more efficient than PWM, look at the graph below which shows the lumen output vs input current for a Cree XML2 LED. You can see that the graph is not linear. Consider a flashlight that produces 1000 lumens at 2800mA. Using PWM to drive the LED at 50% we get 500 lumen. But if you use a linear regulator and reduce the current by 50% (1400mA), the chart shows an output of 600 lumen, or 20% more. For this reason, the A17DD-L FET+1 driver also adds the linear regulator (7135) so the need for PWM on lower modes is reduced. This multichannel approach lets the driver limit the current to 350mA (instead of unlimited through the FET) and use PWM as needed to work from there. Also the 350mA channel gives more uniform low levels whereas the levels from the FET vary with battery strength. When the 7135 is on, it sinks a constant current of 350mA which gives a constant brightness. If you want to have several modes with 7135, we again have to use PWM to control 7135 on times. The driver needs to accurately measure the battery voltage. The driver does this by connecting a voltage divider to one of the pins on the ATTiny microcontroller. When a low voltage is detected, the microcontroller will automatically switch to a lower mode to prolong the battery life, or switch off the flashlight if the battery is dangerously low. The R1 & R2 resistors form the voltage divider circuit that is connected to ADC pin 7 on the microcontroller. Here is how this works. The ATTIny has an internal 1.1V reference voltage that can be used to compare and monitor the battery voltage. For this comparison to work, the battery voltage (typically 3-4V) should be dropped to a value that is near the reference voltage. This is necessary because the ADC pins (pin 7) can only measure voltages smaller or equal to the reference. This is achieved by selecting appropriate values for the R1, R2 voltage divider. The capacitor (C1) provides some smoothing while the 5.1V Zener diode (D1) provides over-voltage protection. As there usually is a diode in front of the µC to provide reverse polarity protection, V_cc to the microcontroller & voltage divider is 200mV to 600mV lower than V_bat. We will call this voltage drop V_diode. Now we can substitute the component values and the desired target voltage to get the ADC value at which the battery alert should be triggered. A 2.8V cut-off is a balance between using as much power as possible and avoiding cell damage. There’s only like 2 or 3mAh left in the battery at that voltage, so we are not missing much. It also provides a longer window for the operator to react and click the light completely off. While the light is on high, voltage slowly drops to 2.7V. LVP kicks in and drops the output to medium. The battery recovers to 3.0V and runs for a while. Voltage eventually drops to 2.7V again, so LVP activates and puts the light into low mode. The battery recovers to 2.9V and runs for a while. Voltage drops below 2.8V again, but there is no lower level to drop to. LVP shuts the light off and enters deep sleep mode. Switch off the flashlight and quickly turn back on. Half-press the switch so the flashlight switches off momentarily. In either methods, the flashlight is effectively turned off, so there is no power driving the microcontroller. How then does the microcontroller keep track of how long the flashlight was switched off? A 1uF Ceramic Capacitor connected between Pin 2 and ground allows ATTiny to detect mode change requests. This capacitor is called an Off-Time Capacitor (OTC). The ATtiny charges the OTC while the light is on. When the flashlight is off, the voltage across the capacitor decays by slowly leaking current through the microcontroller itself (which acts like a giant resistor). 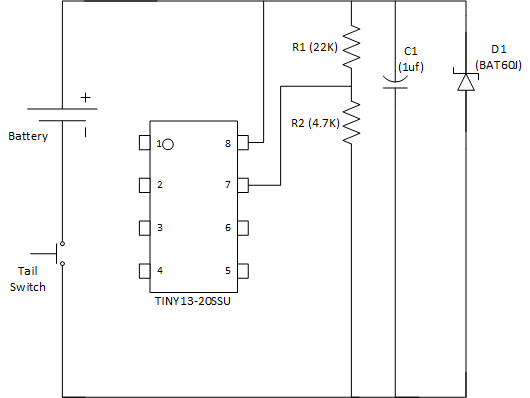 When the light is turned back on, the ATtiny can measure the voltage remaining in the capacitor via the ADC pin (pin 2). If the capacitor is completely drained, the flashlight has been off for a long time and ATTiny keeps the current mode it read from EEPROM. On the other hand, if there is sufficient charge in the capacitor, the flashlight was cycled quickly, so the next mode is selected and written to EEPROM. 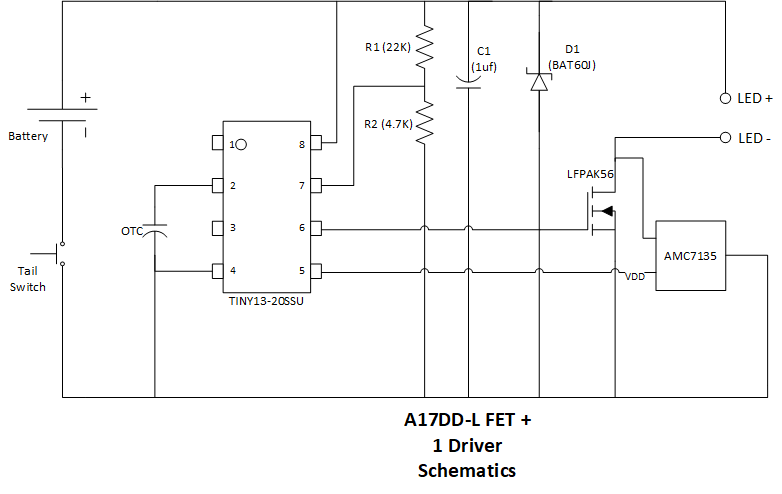 Putting all the components explained together, we arrive at the final schematics for the A17DD-l FET+1 driver. There are several firmware available for this driver. One of the most famous (because it is really well written) is by Toymaker. You can find her firmware here. I have modified Toymaker’s firmware to my own liking and you can find my version on my Github here. * Expects a FET+1 style driver, supports two independent power channels. // How many timer ticks before before dropping down. // Each timer tick is 500ms, so "60" would be a 30-second stepdown. // Max value of 255 unless you change "ticks"
// These values were measured using RMM's FET+7135. // See battcheck/readings.txt for reference values. // See battcheck/otc-readings.txt for reference values. // These #defines are the edge boundaries, not the center of the target. // Between CAP_MED and CAP_SHORT is a "medium press"
/* Battery voltage to blinks mapping for battery check. * We use 18350/18650 with voltage of 3.7v. // mode is set in code. // Track if and for how long we are in turbo mode and drop down smartly. To actually burn the firmware to ATTiny you need to connect an USB ASP programmer to the ATTiny on the driver. Flashlight wiki has a comprehensive set of instructions for creating your own programmer and all the software needed to burn the firmware. Once you have your programmer ready, you can use AVRDude to write the hex file to ATTIny and enjoy.